BRUNCH AND 'WINE DOWN' ARE BACK! Tug Hill Vineyards is one of the many family-owned farms nestled in the Black River Valley region of Northern New York. The 40-acre estate, on the Tug Hill Plateau overlooks the valley and the Adirondack Mountains, making it one of the most serene and picturesque estate wineries. Established in 2007, Tug Hill Vineyards was one of the first pioneering wineries in New York to plant cold-hardy hybrid grape varieties developed in Minnesota. French-American varieties such as Marquette, Frontenac, La Crescent, and others form the foundation of our wine-making practice. We’re dedicated to producing products from grapes and fruits that can grow on our estate. A proud supporter of responsible farming techniques, organic practices, and local farmers, our products are of the highest quality. Come to the tasting cellar to learn about our products, enjoy the wine, and our beautifully landscaped gardens. Take in the view from our timber frame banquet hall during any of our public events like “Wine Down” or our Sunday Brunch, we’re looking forward to your visit! Come and taste our wines whenever we’re open! We offer wine tastings for $5 which allows you to pick 6 wines to taste from our list of over 20 wines, including sparkling wines and dessert wines. Buy 3 bottles of wine and your wine tasting is free! 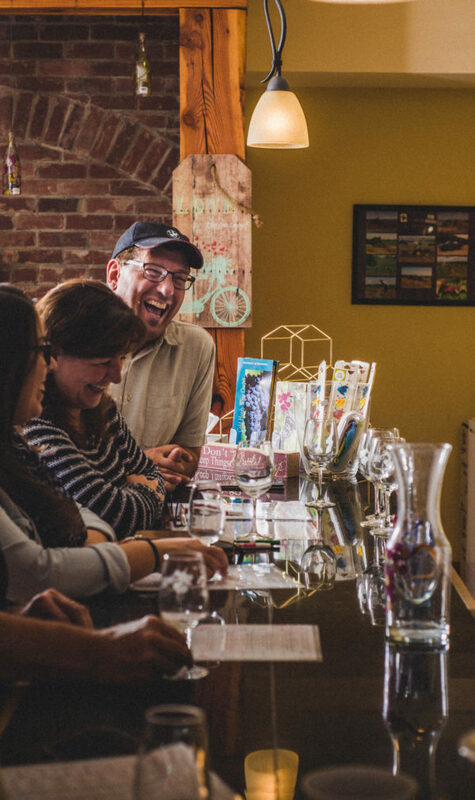 Our tasting room includes a gift shop designed to offer you all your wine related needs. Our tasting room includes a gift shop stocked with wine related products and other local products like goat cheeses, gelato, and coffee. 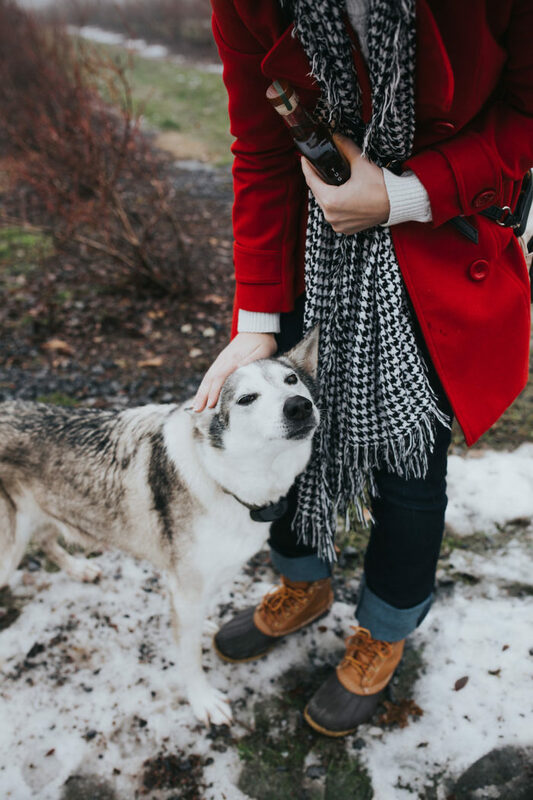 Make the best of your trip by planning to spend some time with us. We have a selection of local cheeses available for purchase, Croghan bologna (a local favorite! ), and crackers available for a snack with your wine. 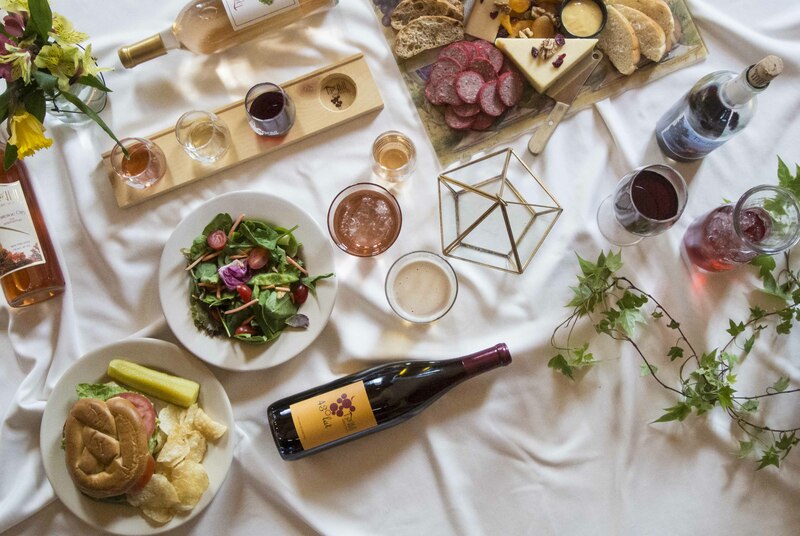 Feel free to bring your own picnic, enjoy a glass of wine or beer available here at the winery and relax in our beautifully landscaped gardens located next to our vineyards. Tug Hill Vineyard’s Estate is open to the public during our store hours. We welcome you to visit and learn more, enjoy a self-guided walking tour, and talk with our knowledgeable staff. 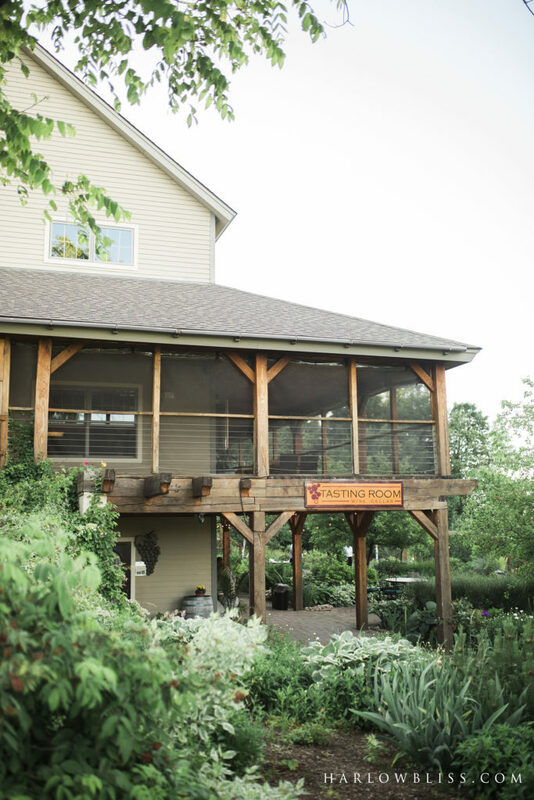 Tug Hill Vineyards Sunday Brunch menu focuses on fresh, seasonal, and local dishes and changes weekly dependent on seasonal trends and market availability. The family style buffet offers a wide range of options for any guest. You can learn more about brunch here. Come “Wine Down” after a long week. This weekly live music event, with a Vineyard quality lite menu that changes weekly, is a perfect way to relax with friends and family. Enjoy our warm fireplace, screened in porch overlooking the valley, or relax in the gardens. Wines, liquor, and beer available at our full bar, no cover charge, no reservations needed. Doors open at 5, check our Facebook page to see upcoming musicians and menu updates. Visit our Public Events Page to learn more about upcoming special events for the public. My favorite winery in NY. Good wine. The place feels like you are somewhere in Italy. November – December: Monday, Thursday, Friday, Saturday: 10am-5pm and Sunday 10am-4pm.